An EBF Maiden Stakes over 7f 16y on good to firm going. A giant field of sixteen two-year-olds. A number of talented juveniles make this one hell of a contest. I will detail a few horses of interest and try to keep this succinct. (Mission impossible). 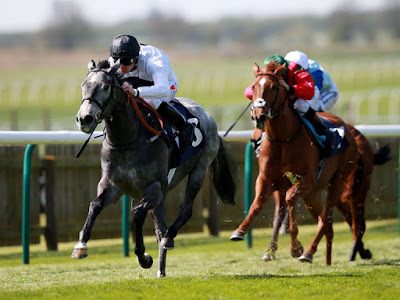 Calibration is held in high regard by Martyn Meade and ran well on debut at Ascot over 6f. This extra furlong, low draw, and valuable experience will see this bay colt go well. In any, average, maiden I would be all over this like a rash but we have a few opponents who will be battling hard. Interesting to see Deningy take a maiden rather than compete at Stakes or pattern class. This chestnut gelding is trained by Charlie Appleby and I'm pretty sure connection will be hoping this son of Sepoy can win and then take his chance at a higher level. He was a touch diappointing last start when defeated by Mutawakked, who is held in high regard by Brian Meehan. Deningy stepped up from five to six furlongs and today he attempts seven furlongs. This may be a revelation although I am slightly concerned he might be a tough keen, which wouldn't bode well. Previously, this March foal had proven to be temperamental and even though better behaved last start I am left with the impression he isn't the easiest of horses. Interesting to note he held an entry for the Convivial at York but takes this instead. City Of Joy is another juvenile to register on my list of talents. Sir Michale Stoute can win on debut although very few do so when bigger than 13/2 SP. It is a difficult to beat experienced horses who are far from your average fare. If strong in the betting it would give greater confidence but I would have to take a watching brief. William Haggas is represented by *Good Omen who was beaten favourite on debut at Ascot. That was an auction race rather than a fully-blown maiden and this juvenile has no lofty entries which suggests this bay colt may still have something to prove. Meteor Light has been going well on the gallops and worthy of respect at big odds. Conclusion: A few big guns here. Cannons. Calibration will go well. He looks a straightforward colt and showed up nicely on debut. This extra furlong is a positive and I wouldn't knock anyone having an each-way bet. Deningy is a funny horse. Clearly talented he is a temperamental cad who has his own ideas. Appleby had him entered for the Convivial at York but decided to let their debutante Capezzano take his chance. I guess in ways that could be taken as a negative because you would think the experience of two races would be an advantage in a huge field. Deningy is held in high regard but I think connection realise he is a live wire and probably hoping this would turn out to be an easy maiden. A wide draw may bring problems if he has to be rushed to find position and stepping up in distance may make him prone to pulling. This gelding could well win well but with a number of niggles I wouldn't feel confident we won't have an issue of some kind and that would make this very hard work. I couldn't bet on Deningy even though I fear him. City Of Joy will need to be very good to win on debut and if weak in the betting is best watched. I wouldn't bet even if fancied in the market.